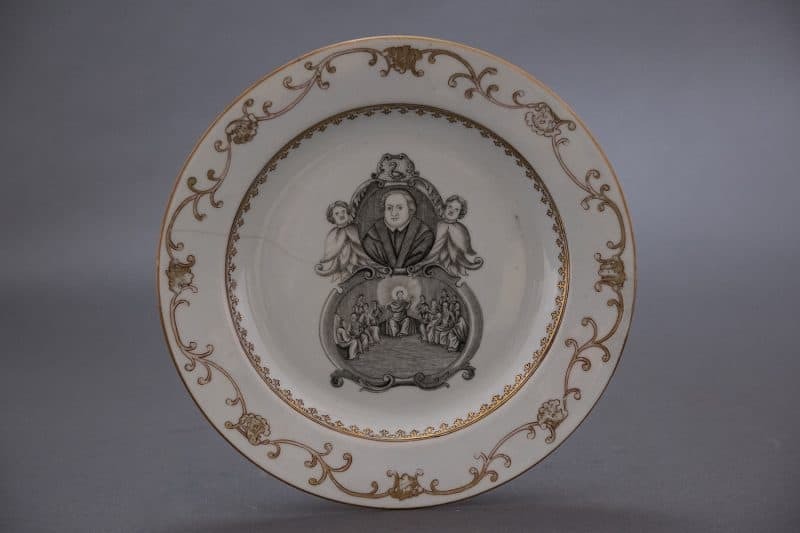 Antique Plate Linked to Special Date On the 500th anniversary of the start of the Protestant Reformation, we take a closer look at a special item in the Reeves Collection — a plate that bears the image of Martin Luther. Almost exactly 500 years ago, on October 31, 1517, a little-known monk named Martin Luther, in the little-known town of Wittenburg, Germany, nailed a list of 95 theses against the Catholic practice of indulgences to the university church door. This small event led to the Protestant Reformation, one of the seminal moments in Western Civilization. Large numbers of people split away from the Catholic Church and created new denominations. One of these was the Lutheran Church, which followed the teachings of Martin Luther. In addition to sparking the Reformation and founding the Lutheran Church, Luther also made an important and influential translation of the Bible. The Lutheran Church spread throughout Europe, and by the 18th century there was a small Lutheran population in the Netherlands, one of the most tolerant and religiously diverse countries in Europe. In the mid-18th century, devout Dutch Lutherans commissioned Chinese export porcelain decorated with their church founder’s portrait paired with a scene of Christ teaching his apostles. The Reeves Collection at W&L includes a plate with this image. Like most European designs found on Chinese export porcelain, the image was based on a print — in this case, the title page of a Dutch Lutheran Bible. Engraved by Charles Brun (active 1627-1648), it first appeared in an edition of the Bible published in Amsterdam by Adolf Visscher in 1648. The Bible, and its illustrations, went through multiple editions over the next few decades. Among these was the Nederduytse Bijbel, which was printed at the Lutheran Orphanage in Amsterdam in 1750 (Nederduytse, more commonly spelled Nederduits, or Low German, is a dialect of German spoken in Northern Germany and the Netherlands). The plate features an image of Martin Luther (top), as well as a scene of Christ teaching his apostles. But the title page was not the only image copied from the Nederduytse Bijbel onto Chinese porcelain. Illustrations from the Bible of four scenes from the life of Christ — the nativity, crucifixion, resurrection and ascension, all based on engravings by the Dutch artist Jan Luyken — were also used to decorate plates and tea wares. The Nederduytse Bijbel was an octavo, a relatively small and affordable book about the size of a modern-day paperback. It is easy to imagine that a merchant, looking for designs to have copied onto Chinese porcelain, would have thought that religious scenes would have market appeal, and would have sent a copy to China, where it was used as a model by Chinese porcelain painters in the port of Guangzhou (which was known to Europeans as Canton). A number of plates with Luther’s portrait are known, suggesting that a number were made. Most do not show much wear, suggesting that they were not used much, if at all. They, like the plates with the nativity, crucifixion, resurrection and ascension, were probably made more for display than use, as a way of demonstrating one’s piety and religious identity. Related: Four Martin Luther tracts housed in W&L’s Special Collections were fully restored in time for the 500th anniversary of the start of the Protestant Reformation. Read more here.